Cat's "Sixth Sense" Predicting Death? Predicting the death of a patient, even an elderly, demented one, is an inexact science, even for a doctor with decades of medical experience. help alert the staff to notify family members in time for them to get to the nursing home to tell their loved ones goodbye. vigil; sometimes he fills in for family members who haven't yet arrived at the bedside. So far, Oscar has "presided over" the deaths of more than 25 residents in the advanced dementia unit of the Steere House Nursing and Rehabilitation Center. Although the story sounds far-fetched, David M. Dosa, MD, MPH, a geriatrician who cares for patients at the nursing home, thought it was time the story of Oscar was heard. On a whim, he wrote an essay about Oscar and submitted it to TheNew England Journal of Medicine, known more for its scientific reports on chemotherapy regimens, drug reactions, infections, and heart defects than reports on feline behavior. "I was quite surprised they agreed to publish it," he tells WebMD. "It is not usually the type of article they will publish." The saga of Oscar, complete with his photo, is in the July 26 issue of the journal. he was spending time with patients as they were becoming terminal." 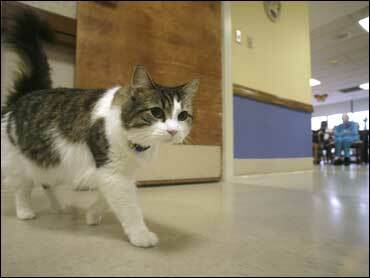 The cat, Dosa says, seems to snap to attention when he senses a patient is about to die. In the essay, for instance, Dosa tells of Oscar arriving at the room of a woman and curling up beside her for more than an hour, purring and paying attention to the patient as the family arrives and the priest gives last rites, then quietly taking his leave minutes after the woman passes away. "As people would pass, the question [among staff] was always, 'Was Oscar at the bedside?'" Dosa tells WebMD. "And the answer was invariably 'yes.' This is an end-stage dementia unit. Deaths are common." acknowledging his work," Dosa says. Explaining Oscar's track record and seeming ability to "read" a resident's end-of-life stages and predict death is a mystery, Dosa and others at the nursing home acknowledge. "Your guess is as good as mine," Dosa says when asked how Oscar picks up the sense of impending death. "We know from some objective findings when death is imminent," Dosa says. For instance, if respirations grow difficult in a very sick patient, he says, doctors may tell loved ones death will probably occur soon. "I think there are certain chemicals released when somene is dying, and he is smelling and sensing those," says Joan Teno, MD, professor of community health and medicine at the Warren Alpert Medical School of Brown University, Providence, R.I., who also cares for Steere House residents. alone. They will hold a vigil." "Animals are intuitive," she says. "We don't give them enough credit." in her leg. "Her leg was ice cold," Teno says. "Oscar wrapped his body around her leg," she says, and stayed until the woman died. Three animal behavior experts say the explanation about Oscar sensing a smell associated with dying is a plausible one. "Cats have a superb sense of smell," adds Jill Goldman, PhD, a certified applied animal behaviorist in Laguna Beach, Calif. In Oscar's case, she says, keeping a dying resident company may also be learned behavior. "There has been ample opportunity for him to make an association between 'that' smell [and death]," she says.